Contains Sizes: 6, 8, 10, 12, 14, 17, 19mm. Long length bit provides the extra reach needed to turn hard to access fasteners. Brushless FEIN PowerDrive motor with 30% greater efficiency and longer service life. 6-Step electronic torque setting prevents shearing of screw heads.10% higher torque in reverse to release extremely tight bolts. 1/2 inch square drive for mounting impact sockets. Robust, solid metal impact gearbox. Metric bolts up to M18 (8.8). 7-Pieces 3/8 in. 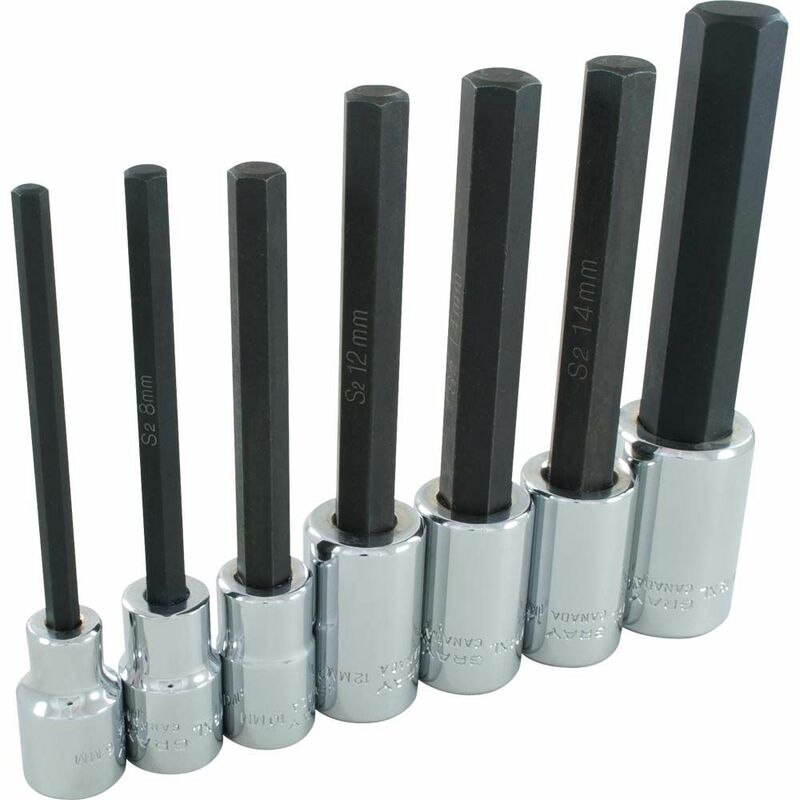 Drive Metric Standard Hex-Bit Socket Set is made of chrome vanadium steel to provide strength. The Bit Sockets feature a chrome finish that provides resistance to corrosion. The chamfered lead-in on the drive end for quick and easy placement onto fasteners. Socket Set Hex Head 7 Pieces 1/2 Inch Drive Extra Long Metric The hex head sockets in this 1/2" drive 7 piece metric set feature outstanding corrosion resistance as a result of our proprietary in-house plating process. The sockets are made from premium tool steel for maximum durability and each bit has a precision tip ensuring a tight and secure fit with the fastener. Made in Canada and backed by Gray Tools worry-free lifetime warranty.